Everyone loves iPhones and Apple devices even though they are a costly affair. Why? For starters, Apple devices have a very sleek and compact design such that anyone who uses it for a few moments becomes a fan. And the user interface is also very easy to use, and moreover, it becomes sort of like a necessity for users who are already accustomed to it. But unfortunately, not everyone can afford a Mac or iPhone. So an iOS Emulator is the only viable option in front of you to get a Mac-like user experience with your Windows device. These emulators can mimic the iOS interface that can successfully put you under the illusion that you are using an Apple device. And for developers who want to test a particular iOS app they have just made, iOS simulators are the final word. They might not need an Apple device but just an emulator that can run an iOS environment so that they can know how it works and make the necessary bug fixes afterward. Here are 9 iOS Emulator tools for Windows. iPadian is an easy way to get iOS-like interface on your Windows device. You have options to get the free version or the paid one. With the free version, you get the iOS emulator, app store, and iOS games. However, the paid version which costs $10 can offer you much more. You get to use WhatsApp, Snapchat, and other apps. Also, there are 3D games and all the Android games. And above all, the paid version gives you an ad-free experience. To use iPadian, directly download the emulator and then click on the shortcut created after installation. For those who still need help, follow the tutorial video given in the iPadian website. You can search for games in the iPadian interface and click on them to play it. Air iPhone is a tool to run iOS apps. It replicates the iPhone interface on your device. To run this emulator, you will need AIR framework. You can install almost all the iOS apps. Although the reviews do not fully recommend this emulator, you can still install it to get a basic experience of handling an Apple device. MobiOne Studio can be used for simulating and emulating iOS. This works for developing cross-platform mobile apps for iOS and Android systems. With MobiOne, you can quickly build native iOS apps, and these can be used on any device that is compatible. You can create status notifications, share web app links and apps through email and configure your app to run on iPhone and iPad. And also, you can view the status of your app with the help of App Center Progress view and download the app installation file on your computer once the project is completed. To ease the user experience, there are drag and drop options. You can run a lot of iOS and iPhone apps and games using iPhone Simulator. And not just that, you can even test your under-developed apps to find its issues and bugs. So now, your phone can be a virtual iPhone. The graphics and the iOS emulation are pretty impressive with the features being so real. However, one disadvantage is that you cannot directly access App Store, and few of the iOS apps cannot be run. You can make customization as well as try the default applications that come with it. The wallpaper, clock and other features of iPhone can be accessed. Xamarin is a fully functional iOS emulator. With the developer support that it provides, Xamarin is undoubtedly the best tool for getting an iOS-like environment in your Windows devices. There are tutorials and detailed guides by the developers to help you familiarize the tool. This is not a free tool, but it is useful for iOS developers for testing their app. iPad Simulator can help you get iOS apps and games on your Windows device. So with this tool, app designers can test apps at nascent stages and make further corrections. The graphics and the interface are impressive and look exactly like that of the real iOS devices. But unfortunately, like a few other emulators, in iPad Simulator you can’t get access to the Apple App Store or access some apps by default. It offers lots of flexibility to the developers in creating their apps. It supports almost all the latest versions of iPhone, iPad, iPod Touch. To emulate any application, you will have to get the app. With Smartface studio, all of this can be done with a single click! READ : How to Fix & Solve Error 0xc0000142 Code Problem? 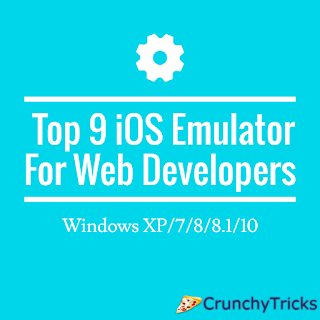 So far, we have seen powerful emulators and simulators that are capable of running iOS apps on Windows platforms. Now, if you have developed a website and if you want to check whether your site works in mobile devices by Apple, there are some website simulators that tests and shows the preview of how it looks on iPhones. These are mostly websites, and they are totally free tools. Using this tool, you can test your site on iPhone 3G/ iPhone 4, iPhone 5 and iPad 2. You just have to enter the URL in the field provided and check. The results will show how your app looks on these devices, and you can totally use these previews to carry out the presentations. And it is very practical for debugging. Mobile Test is an iPhone 5s emulator which can be used to test your websites and web apps. You have to enter the URL of the site and give it a go! It has a very user-friendly interface and in addition to iPhone, it also supports a broad range of Samsung and Sony Xperia smartphones. So we have seen the iOS emulators and simulators. By now it must be clear that an emulator can totally duplicate the iOS environment and replace the original devices. They can run iOS apps without modifying the actual device. So for those users who are looking forward to having an iOS experience even on their non-iOS devices, these emulators are handy. And simulators on the other side can set up an environment similar to that of the original OS. Apparently, these are used by app developers and tester who want to check if their yet- to-be-completed apps will successfully run on the iOS platform. Since they do not replicate the hardware, some applications may run differently on the simulator and the actual device. And in practice, a simulator will be faster than the real device. Now if you want only to test your web apps and web pages, there are tools for that too! Having understood that and knowing what you need, pick out the best one for you. Yes, you don’t need an iPhone to know what it is like to have an iPhone. And designers, don’t worry about buying a new iPhone or Apple device to test your iOS app, let the emulators do the work for you.